JBC Tools C210024 Chisel Cartridge Tip has a screwdriver shape and is perfect for soldering chip components of size 00603. JBC Tools C210024 cartridge tip has been designed to solder jobs with medium power requirements. JBC Tools C210024 cartridge tip are appropriate for precision soldering jobs with medium power requirements. Due to the size, this C210024 JBC Tools cartridge tip are perfect to work with SMD, under a microscope, or with conventional components. The JBC Tools C210024 cartridge tip last 5 times longer than other brands thanks to the Exclusive Heating System and the Sleep & Hibernation features. The JBC Tools C210024 cartridge tip works with the T210 Precision Handpeices. The C210024 Cartridge Tip offers instant heat up, excellent heat transfer and great durability. 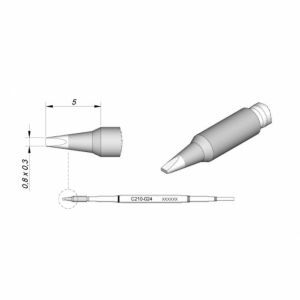 Purchase a JBC Tools C210024 Chisel Soldering Cartridge Tip Today.